On Friday, August 25, 1950, Bill and Meta Juhnke with their four children (Jim, Janet, Bill Jr., and Sharon), age twelve to two, loaded their belongings into a pickup truck, trailer and car, and moved from their farm in McPherson County to the small town of Lehigh in western Marion County. They drove seven miles north and sixteen miles east, past the small towns of Galva and Canton, on the way to Lehigh. Bill Juhnke had taken a job as principal of Lehigh Rural High School. But he did not let go of the farm near Elyria. He had a nine-month contract at $3,500. For the next eleven years, until May of 1961, the Juhnke family lived in Lehigh during the school year and on the farm during the three summer months. The next day, Saturday August 26, the family drove back from Lehigh to the farm "to take baths." Lehigh did not have a city water system, and it would take some time for the Juhnkes to get accustomed to cistern water. At first they brought water from the farm in a ten gallon can. Bill's parents, Ernest and Alvina Juhnke, and Bill's youngest sister, Martha, had moved into the Juhnke farm house some ten days before Bill and Meta's family left. This was a return to the farmstead that Ernest and Alvina had left in 1937 when Bill and Meta were married. Ernest and Alvina eventually moved to a new house that Ernest built in nearby Elyria. In the 1950s the Juhnke farm house occasionally had short term renters. Most years the house was vacant during the school year. For Meta the transition to Lehigh was stressful. She was in fifth month of pregnancy with Ruth Elinor, who would be born on December 24, the day before Christmas, 1950. The Lehigh house was much smaller than the farm house. It needed new wallpaper (stripes in the living room and matching flowers in the dining room) and other furnishings. Pipe lines had been laid to the house for Lehigh's new natural gas system , but, as Meta wrote, "We are not connected because they ran out of meters when they got to us." Neighborhood children--something one didn't need to cope with on the farm--came into the house and got in the way. The big Jantz family down the street, whose father was "in prison for stealing chickens," seemed to be a problem. Meta wrote to her sister Mary Ann Preheim, "We made a rule that Junior and Janet couldn't go into their house and they couldn't come into ours from now on." Mary Ann had recently moved from the small town of Moundridge to the big city of Denver. "How did you do it?" Meta asked. "It will probably take until Xmas until we're settled," she wrote, "or longer." New friends in Lehigh helped in the transition. Henry and Marie Guhr invited the family for a wiener roast on moving day. 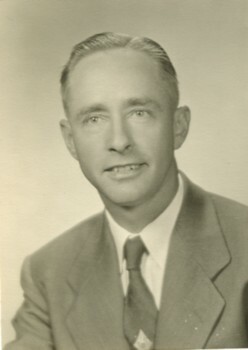 Henry was director of the Lehigh school board, a Bethel College grad and former Civilian Public Service camp director, and operator of "Hank's Auto-Electric" store downtown. He was one of the most supportive kindred spirits in town. Peter W. ("Shiek") and Mary Goering lived two houses down and also gave a warm welcome. Peter, originally from the Eden Mennonite Church and Meta's second cousin, was pastor of the Lehigh Mennonite Church and part time teacher of math, science and journalism at the high school. Mary was, in Meta's judgment, "a very fine minister's wife." She had met Peter at Hartford seminary and was, in the view of some family members, a better preacher than her husband. The Goerings had a small pasture and a milk cow, and sold milk and cream to the Juhnkes at good prices. Their twin children, Peggy and Peter, were the same age as Sharon. 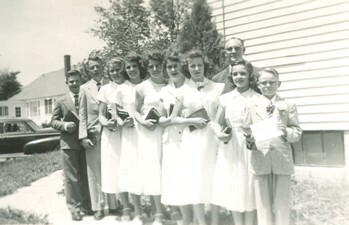 Lehigh Mennonite Church baptism class, Jim Juhnke second from the left. Rev. Peter W. Goering, pastor. 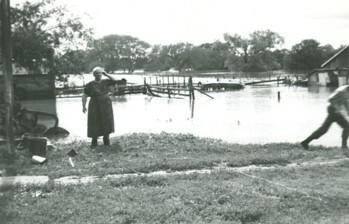 Spring 1954. The population of Lehigh in 1950 was 240 persons, less than half the number who had lived there four and five decades earlier. The first settlers had been nearly all German-speaking folk, mostly immigrants from Russia. The town had grown along a branch of the Santa Fe Railroad built in 1879 westward from Marion to McPherson. Near the McPherson County line, the railroad took a short diagonal route. The streets of Lehigh were laid out on the bias, as the locals boasted, "so the sun can shine in from all sides of the house." As in all Kansas railroad towns, the Lehigh skyline was dominated by tall grain elevators that received, stored and shipped wheat grown in the fertile surrounding farmland. In its thriving heyday, Lehigh had had more than forty business and commercial establishments, two banks, a city jail, a broom factory, and a printer that published three German-language periodicals. The depression of the early 1930s had devastated the town. Some thirty houses were abandoned or removed when owners could not pay their mortgages. The town never recovered. Lehigh in 1950 had three church congregations, all originally German speaking. Two were Mennonite-Mennonite Brethren and General Conference Mennonite. One was German Lutheran. A Seventh Day Adventist church in Lehigh, also with members who had immigrated from Russia, had closed its doors in 1943. By 1950 the Mennonite Brethren and Lutheran churches were declining rapidly. They closed in 1953 and 1956 respectively. Lehigh's population continued to decline during the years the Juhnkes were there, from 240 in 1950 to 178 in 1960. The signs of decline-abandoned houses and lots-were all over the town. Meanwhile, Lehigh's economy survived as a grain center and farmers market. A "Lehigh Booster Edition" of the Hillsboro Journal Weekly (November 19, 1953) acclaimed Lehigh as the "Wheat Storage Center of Marion County," with storage facilities for 331,000 bushels of grain. The newspaper editorial stated, unconvincingly, that "Lehigh's star has not faded." Bill Juhnke was not concerned about evidence of Lehigh's decline. His new job as high school principal fulfilled a long-held ambition and offered an attractive opportunity to exercise his leadership skills. It had been eight years (1942) since he had completed his master's degree in educational administration at the University of Kansas. He had enjoyed his four years as a primary school teacher at King City and Pleasant Ridge (1946-50). But he was overqualified for that work. Now he enthusiastically engaged the challenges of being the central leader of a larger institution. The Lehigh school district had recently gained new status as a rural district with a wider agricultural tax base of 32,700 acres. Bill was the first principal of "Lehigh Rural High School"--and the target of hostility from some anti-school taxpayers. Even though there would be only about fifty students, and the small teaching staff would have to teach classes outside of their fields, Bill took on the job with vigor. Lehigh Rural High School, 1954. 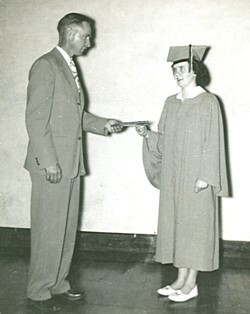 He eagerly recruited new teachers for the high school, attempting above all to hire Bethel College graduates: (Especially Gerhard Buhr followed by John R. Dyck and Francis Funk, industrial arts and athletic coaches; John Gaeddert followed by Robert Unruh, and Anna Fern Lakin, vocal and instrumental music teachers). Prior to the beginning of classes the first year, he invited students to his office to get their suggestions for the running of the school--establishing a rapport that was new and exciting for them. He enjoyed teaching classes in history and psychology, coaching the debate squad, advising the student council, organizing district sports competitions, and accompanying students on their senior "sneak" trip. He never stopped being an entertainer. At the school opening in September, 1953 he announced, "There will only be a half day of school this morning." The students applauded. Then he said, "The other half day of school will be this afternoon!" Bill was somewhat less enthusiastic about some extra administrative duties such as supervising the hot lunch program, and filling in as director of class dramas when no one else was available for the job. --with limited resources he made the most of what was available . . .
--a high student morale was maintained . . .
--supportive of the teacher and fair to the student in discipline matters . . . ."
Gaeddert also thanked Bill for continuing his personal interest and friendship in subsequent years as he moved away from Lehigh and into a career as a Mennonite pastor. The Juhnke house in Lehigh was on the northeast side of town, two blocks from downtown and a block and a half from the school building. The old school housed the first eight grades in four rooms on the first floor, and the high school and principal's office in four rooms on the second floor. Diagonally across the street south from the Juhnke house was the Mennonite Church. Everything was in close walking distance. Also in the living room was the new Zenith television set, first purchased in about 1952. It was one of the very first TV sets in Lehigh. Television probably taught the family more about modern American life and culture than they learned otherwise at school and church. Grandparents Ernest and Alvina had earlier gotten a TV on approval from the Elyria hardware store, and watched the Liberace piano performance show and news about the shifting military fronts in the Korean War. But Ernest decided that TV wasn't for him. He returned the set to the store. Meta, who had long listened to radio "soaps" such as "Helen Trent" and "Ma Perkins," now watched some of the TV soaps with her daughters during the summer. Meta liked the Arthur Godfrey and Ed Sullivan variety shows. Jim remembers seeing the Beatles on the Ed Sullivan show--not realizing it was the very beginning of a popular culture revolution in the country. On Wednesday evening after church choir practice a flock of Mennonite young people filled up the dining room to watch the weekly boxing matches. The family was pleased that their house was a social center, but Meta was not pleased when youthful TV viewers leaned their heads, greased with Bryl Cr�me, back on the wall and left permanent stains. 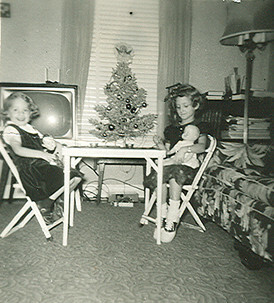 Ruth and Sharon in Lehigh house, December 1955. Zenith TV and Christmas tree in background. The living room opened through a wide arch to the dining room. The family always ate their meals together around the dining table, beginning every meal with table grace. "Come Lord Jesus, be our guest. Let this food to us be blest." Meta prepared delicious and nutritious meals-strong on milk, cottage cheese (often fried to make verenike), meat, potatoes and vegetables. Dessert was fruit or sweet pastries. Rice was not a main dish, but a dessert served with sugar, cream and cinnamon. Every Sunday morning without fail there were cinnamon rolls and cocoa. The evening meal was called "supper," though the kids became vaguely aware that sophisticated urban people called the evening meal "dinner." Supper was an important time for sharing family news and working on relationships, and learning discipline. Sharon remembers, "I got reprimanded for singing at the dinner table once. Dad told me to be quiet, but I didn't believe he was really serious, until I kept it up and he scolded me more severely. . . . I was pretty sensitive and sharp words were enough for me to back away, lips quivering and tears forming." Supper times, as well as Sunday dinner, were occasions for discussion of religion and politics. Bill loved to raise skeptical questions, sometimes to Meta's dismay. Meta had a more unquestioning devotion and unwavering faith. When Jim went to Bethel College in the fall of 1956, he brought home guests, and Bill always tried to draw out their ideas and experiences. One of the guests, Jim's roommate from Taiwan, was an atheist. Ruth observed that his ideas did not fit with what the teacher said in the Lehigh Mennonite Church Sunday School class. She was impressed with her father's suggestion, quoting theologian Paul Tillich, that God might be understood as the "ground of being" rather than as a bearded grandfather in the sky. On the northwest wall of the living room was the crank-style telephone. On the southeast side was the gas heater. Bill Jr. remembered "scrambling, perhaps even fighting for a space to warm up on cold mornings throughout winter. Once, in the struggle, I got too close and burned myself seriously--blistering a big scar on my left calf." The kitchen, on the northeast end of the house was a small space, with a window above the sink looking out to the garden in the back. It was the domain for women. Meta prepared all the meals. The girls did the dishes. Not too long after the move to Lehigh, Bill and Meta bought an upright freezer from Bill's brother, Carl. The freezer came with a year's supply of frozen food. It also held packages of frozen pork and (less frequently) butchered beef from the farm. One abortive butchering episode came when Grandpa Juhnke in Elyria, with his son Bill's consent, decided to butcher a pig--a boar that had not been castrated properly. In Bill Jr's memory: "We had the meat packaged--there was a lot of it. It smelled like pig urine. We must have thrown most of it out in the end." One of Meta's favorite jokes, a story about the four bears, suggested her view of family members who complained too much about food: "Papa Bear said, 'This porridge is too hot.' Sister Bear said, 'This porridge is too cold.' Baby Bear said, 'My porridge doesn't have enough sugar on it.' Mama Bear said, 'Gripe, gripe, gripe. I haven't even poured the porridge yet!'" Off the kitchen in the southeast corner of the house was a small bathroom, with no sink. It had just enough room for a clawfoot bathtub, a toilet (after a few years of depending on outside toilets), and a trap door to the basement. In the absence of a water heater, the family heated water for baths in a tea kettle. As they took turns bathing, they used the same water--warmed up with more water from the tea kettle. 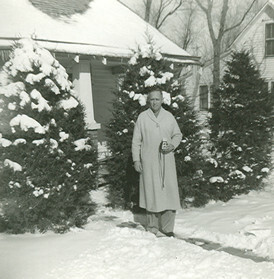 Bill Juhnke in front of the house in Lehigh, December 1958. Upstairs were two bedrooms, plus a smaller room at the head of the stairs. Jim and Bill Jr. had the northwest room. For a time, all three girls (Janet, Sharon, and Ruth) slept in the same bed in the southeast room. Then Janet got her own separate bed in the crowded room. The bedroom closets were cramped spaces beneath the angled roof. The upstairs rooms were not adequately heated. Bill bought a small gas heater and placed it in the room at the head of the stairs, but Bill Jr. claimed the heater barely kept itself warm. On the coldest night of the decade (twenty-one degrees below zero according to the McPherson radio report), a glass of water beside the heater was frozen. During better weather, Sharon and Ruth turned the room at the head of the stairs into a playhouse where they played endlessly with dolls. As Ruth remembered, "When we got the Tiny Tears dolls that you could feed and then they would cry and also pee into their diapers--wow, I thought that was cool. I was devastated when my favorite walking doll with blond pigtails and the moving blue eyes broke and she would no longer open her eyes." Jesus tender shepherd hear me, bless thy little lamb tonight. Through the darkness be thou near me. Keep me safe till morning light. Through this day thy hand hath led me and I thank thee for thy care. Thou hast clothed me, warmed me, fed me. Listen to my evening prayer. Take me when I die to heaven, happy there with thee to dwell. More than one of the Juhnke children hoped that, if they had to die, it would be at night after they had asked for forgiveness for their sins, rather than during the day when their most recent sins had not yet been taken care of.